Access to Jerry White’s Valletta townhouse is up three flights of steps and the living quarters are another three floors above, a trek for the unfit, let alone for someone who lost half a leg in a minefield. Or is it? Mr White, an American political activist, social entrepreneur and expert on “survivorship”, is so unfazed he never even counted the steps. He is only too pleased they put off the previous owner, who was pregnant at the time, speeding up the negotiations to purchase the house he loves. “It is good exercise, plus these old stairs have a sense of mystery and worn wisdom to them,” is his poetic take on the situation. In addition to climbing stairs, Mr White’s good knees and prosthetic limb allows him to play tennis, run and swim. Judging by his optimistic approach to his injury, sustained in Israel when an explosion during a camping trip in an unmarked minefield blew off the 20-year-old student’s leg, it is not surprising he is the author of the book, Getting Up When Life Knocks You Down: Five Steps To Overcoming A Life Crisis. As one of the recognised leaders of the 1997 Nobel Peace Prize-winning International Campaign to Ban Landmines, his role is to change the way people see them. Landmines do not bring security or protect borders against terrorism, he insists. They are just military litter that kills many more civilians (80 per cent) than soldiers. From his “oasis” in Malta, which he shares with his wife and four children, Mr White is drawing inspiration from the sea outside to write another book on “the 60-second soul”, looking into the spirituality of survival. “The world has it reversed: it is all about the body and the five senses. So I’m exploring the idea of how soul-led work achieves more change,” says the man who helped draft the first arms’ control treaty, obliging rehabilitation for the victims of a weapon. Mr White is serving as international chairman of the Roots of Peace Campaign for a Mine-Free Middle East. So far, as a result of his work over the last 15 years, about 160 countries have banned and destroyed their stockpiles, with another 30 to go, meaning casualties have decreased from 30,000 a year in the 1990s to about 6,000. But it was Diana, Princess of Wales, who was the tipping point for international awareness on landmines, “reframing the issue from a security to a humanitarian conversation”, he maintains. Mr White escorted her on her last humanitarian mission to Bosnia-Herzegovina and recalls “she used to tell me the most important thing was to care enough to show up when people are hurt”. Through his work with King Hussein and Queen Noor, Jordan will be free of landmines next year. Israel and Palestine are 10 years behind, having held on to the mistaken belief that they need them, he says, still optimistic, despite the resistance. Mr White is also the co-founder of Survivor Corps, which was recently closed but has helped several war victims rebuild their lives. “Recovery is not just about crutches and a fake leg. 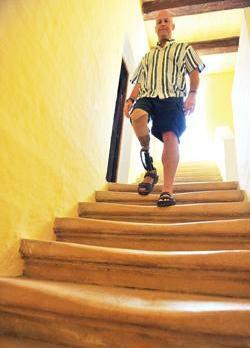 Losing a limb is not the worst part; it is losing your place in society and your dignity,” he explains. Busy working in the Balkans, the Middle East and Africa, Mr White was tired of shuttling across the Atlantic and was looking for a point to access these areas quickly. Malta was the ideal location: an indecipherable dot that “jumped out” of a map in a travel magazine. “If you marry Dublin (his wife’s choice) and Jerusalem (his), you’d get Valletta, a walled city, on the ocean, without the problems in Israel. Mr White is using the island to embark on his next chapter, which entails fulfilling his “vision of life in a landmine-free, barrier-free, victim-free world”, to eradicate the unhealthy and increasing culture of victimhood.